Should a Toilet be the focal point of a Bathroom Design? - Mountain Log Homes Of Colorado, Inc.
Should a Toilet be the focal point of a Bathroom Design? When designing or remodeling modern bathrooms, the toilet itself is often purchased without much thought or research. Though the precursor to the modern flush toilet system was designed in 1596, such systems did not come into widespread use until the late nineteenth century. The use of the outhouse near the family home was also common until chain-pull indoor toilet, was invented in England in the 1880s and soon introduced to America, in the homes of the wealthy and in hotels. Public awareness of germ theories about disease, as well as inexpensive manufacturing methods, helped the flushing toilet to spread to middle class America by the 1920's along with indoor plumbing. The basic theory of flushing toilets has not changed in centuries, however the options, styling and environmental impact of this necessary device have changed. 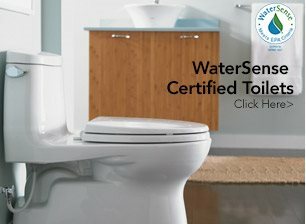 In remodels, it is not uncommon to find toilets using as much as 5 gallons per flush, modern low flush toilet designs allow the use of much less water per flush 1.2 gallons per flush—Dual flush toilet allow the use to select between liquid and solids. In today's Western States drought crisis, water usage should be a consideration in all construction and remodels. 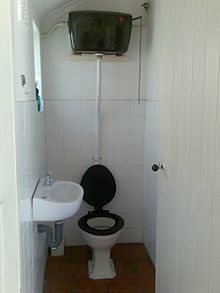 The amount of water used by modern toilets is a significant portion of personal water usage, or about 25 gallons per day per person in the USA, more with old fixtures in place. 'High-tech' toilets include features such as: automatic-flushing mechanisms; water jets, or "bottom washers" like a bidet; blow dryers; artificial flush sounds to mask noises; and urine and stool analysis for medical monitoring. Matsushita's "Smart Toilet" checks blood pressure, temperature, and blood sugar. Some feature automatic lid operation, heated seats, deodorizing fans or automated paper toilet-seat-cover replacers. Interactive urinals have been developed in several countries, allowing users to play video games as with the 'Toylet', produced by Sega, that uses pressure sensors to detect the flow of urine and translates it into on-screen action. TOTO even offers a commercial toilet that generates electricity with every flush for airports and other high traffic applications. Some manufacturers show uneasiness with the word “toilet”. 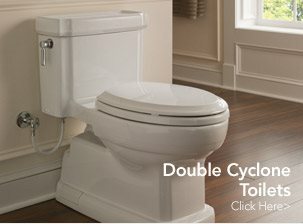 American Standard sells them as "toilets", yet the higher priced products of the Kohler Company are sold as commodes or closets. TOTO (Japanese though made in Georgia, USA) are referred to as "toilets", even though they carry the cachet of higher cost and quality. When referring to the room or the actual piece of equipment, the word toilet is often substituted with other euphemisms. We have come a long way from Victorian Era Chamber Pots... whether you call it the Loo, WC, Privy, or Latrine we hope you will give the selection of the toilet the respect it deserves in your next bathroom design project. In addition to all the new features offered by manufactures, the style has also come a long way. The toilet is no longer the generic bowl and tank. Manufactures have enlisted the help of furniture, clothing and even jewelry designers to make this piece of porcelain fit any bathroom design from traditional to ultra contemporary. The toilet has been elevated to a focal point of any bath design.